Business is booming in your manufacturing plant. Work orders are flying in and it is getting to the point that you are having to turn work away to keep the plant uncluttered and safe for your employees. As you are heading home one day, you notice that the parcel of land beside your plant is up for sale. The next thing you know, you are now the proud owner of an empty parcel of land. You need to get a few buildings with varying amenities, additional equipment, and either hire a general contractor to manage the construction and assembly of the new space or take this task on yourself. At Panel Built Incorporated, we have at least one of these items on your new factory shopping list covered. 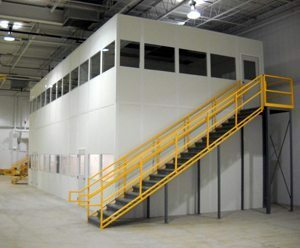 We offer quality prefabricated metal buildings at an affordable price. With over twenty years of experience, we have been able to master creating equipment enclosures and storage facilities, as well as mobile training centers, which could be used for not only training but in an educational field as well. These are only a few of the items that we can offer you. While your company has occupied the same location for a little over twenty five years, the building codes have changed. There are even some codes in new disciplines. A couple years ago, when the code enforcement officers came out for their yearly inspections, you thought you were completely in code. That was until you were told about the county’s new noise pollution code. You had only a couple of months to show that something was being done to correct the violation, so you called on us. Our equipment enclosures offer many basic benefits for your machinery. By building an equipment enclosure, you will be able to protect your machinery from the elements, extending its life as well as lowering the maintenance costs. By sheltering your equipment, you prevent having to have a service technician come out onsite to repair damages caused by forces of nature. As mentioned above, some counties have created noise pollution codes, which would eliminate the ability to have your rotating equipment outside. Because of these codes, you would need to place your equipment in an enclosure, to keep the decibel level on your land acceptable to satisfy both your neighbors but also satisfy the county, should they ever stop by. Usually when you hear that you have to attend a meeting, you either grimace thinking something bad is going to happen or get ready for a long drawn out meeting involving reports, numbers, or product training. It usually isn’t a wonderful thing to attend. By using a modular training facilty for your group feel more connected and it enables them to look at things from a different angle. How? Because unlike most conference rooms, which are built big and spacious to impress clientele, it really doesn’t work with smaller groups in mind. With a modular training facility, you can eliminate some of the obstacles that holding a meeting in a conference room can present. One of the best examples is the size. Because a typical conference room is large, when a small group gathers in it, sometimes it is hard to hear and it usually gives off a cold feeling, making your teammates uncomfortable. With the modular training facility, you can give your employees a nice intimate and warm feeling setting, where the group could talk with ease about whatever the subject is at hand. In addition to this, the environment inside will be more comfortable as well. In the usual conference room, because of its size, the climates could vary. There are multiple heating ducts in a specific office and if you have a room that takes a few of the dedicated heating ducts to maintain its temperature, you’ll end up creating heat and cold pockets, making it pretty uncomfortable during the gathering. With our modular training facility, you and your team will be able to have a more informative meeting. With school districts constantly merging and separating, you never know what a given population for a specific grade will be until class assignments are made. The benefits of purchasing and using a modular classroom for both the district and the students are numerous. When you have a tight utility budget, a prefabricated modular classroom may be the best option. Although, the classroom will need to use additional electricity to power the lights and air conditioning, because the area is smaller, the air conditioning will be on for a shorter time. This also applies to the heater if used. One of the best features about this classroom is that it is mobile. If you have an influx of children at one school in one year, then a few years later another school has a similar situation, you could relocate your classroom. As a parent, you want to make sure your child is getting the best education that can be offered. With a brick and mortar school, there are several activities occurring outside the classroom that could distract your child. With a mobile classroom, there are less distractions and more room to focus. Climate control is another aspect that beneficial. We want to make sure your child is comfortable while they learn, so HVAC units have been installed on every unit. As you can see, when you get one of our prefabricated metal buildings, you are getting high quality prefab metal buildings with affordable prices.